China issued a red alert, the highest level, for forest fire risks in arid northern and southwestern regions, including Sichuan province, where a forest fire broke out on Saturday, leaving 27 firefighters and three others dead. Beijing, Tianjin, and the provinces of Hebei, Shanxi and Sichuan, will see the risk of forest fires stay at the highest level until Monday, and "under the red alert, no open fires are allowed in forests and grasslands", Yang Xiaodan, chief forecaster of the National Meteorological Center's Public Information Center, said on Tuesday. The alert was issued based on comprehensive considerations, including the persistent dry weather, strong winds and high temperatures, and also the coming Tomb Sweeping Day, which falls on Friday, when thousands will travel to ancestors' grave sites and in some cases, burn offerings. "Recent satellite data has shown areas of heat and fire were much more numerous than average levels in recent years," Yang said. It is the first red alert for forest fire risks this year, with the last one issued in March 2016, the center said in a statement. The red alert was announced after the deadly high-altitude forest fire broke out on Saturday in the Liangshan Yi autonomous prefecture, engulfing around 15 hectares of forest. It was the deadliest event for rescue workers since the Ministry of Emergency Management formed last year. The authorities have applied for them to be officially declared heroes, the center said on Tuesday. The forest fire was brought under control at 3 pm on Tuesday through joint efforts from five helicopters and over 500 firefighters, said Tang Yi, director of Liangshan's security enforcement team, on Tuesday afternoon. Sichuan has opened a special investigation into the cause of the blaze and will release the results in due time, he said. By Tuesday afternoon, 23 bodies had been transported to a funeral home in Xichang, Liangshan Yi, where the firefighting team was based. 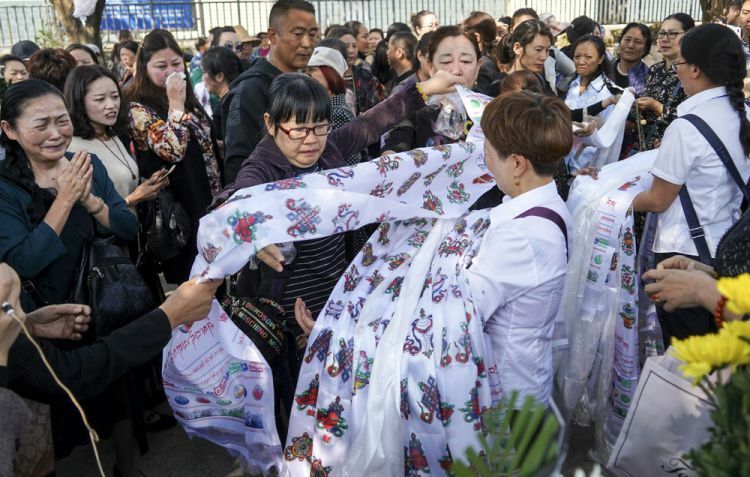 Some 3,000 locals visited the mortuary, holding chrysanthemums, wreaths and hada－white ceremonial scarves－in their hands. Many had tears in their eyes, said Song Ming, an information officer with the prefectural government information office. Of the 30 victims, the oldest was 49 and the youngest 19. Zhang Hao, a 29-year-old victim, had recently married. Before the tragedy, all the information he uploaded in his WeChat Moments was about his firefighting missions. In one photo, he showed how difficult it was for him to clean his hands after one mission. Jiang Feifei, another 29-year-old victim, said via his WeChat Moments that he was washing his clothes when he was asked to rush to the deadly blaze after just two missions.